Are you familiar with Charity:Water? Founded in 2006, the organization has reimagined how donating money for a worthy cause (in this case, ensuring that clean water is available to all) is done. Having recently created a Charity:Water campaign in honor of my dad, I was struck with how intuitively friendly, talk worthy and fun Charity:Water has made giving and contributing to a cause. In fact, I came up with 7 customer experience insights for you to consider for your business - whether it's a charity or not. Charity:Water isn't a total unkown to me. In 2010, Age of Conversation 3 (a collaborative book that bloggers from around the globe each contributed a chapter to) dedicated all sales proceeds to Charity:Water. And learning that Charity:Water has embraced inbound marketing (and HubSpot), storytelling and "radical transparency giving donors the security and comfort of knowing that every dollar they donated would directly benefit their mission" to completely reinvent charity. "...sharing the impact of your organization’s funds raised may not have been a high priority in the past. But with the growing debate of overhead vs. impact, supporters are looking for the results of their donation more and more. Charity: water has woven this concept into their model from the beginning. How many charities have you experienced which show you exactly where your money goes and confirm back when the project is completed? Here is Charity:Water's track record of completed projects. Furthermore, how many charities funnel 100% of your public donation to the cause - one of my mom's stipulations - let alone let you know what the percentage is? Ironically, charity organizations face stiff competition. They are numerous (over 1.5 million non profit organizations in the U.S.). All compete for discretionary monies. 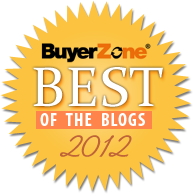 Although many are worthy, plenty are questionable (see Charity Naviagtor Top Ten Lists). Not too different from the for-profit world. How then to stand out? Charity: Water has done so by embracing what their customers value - transparency and simplicity - and sharing the stories of the people being served. Although Charity:water immediately came to mind when I was thinking about how best to remember my dad - in addition to transparency and 100% donation to the cause, lack of clean water is something we saw firsthand living in Africa - I had to justify my recommendation to my family. I researched other charities and was appalled at how difficult setting up a memorial fund in the middle of the night was. Most of these other charities facilitated individual contributions online, but not a campaign to welcome donations around a common theme or reason. When that was possible, it required a phone call and several days to set up. I sent emails asking questions of Charity:Water and other organizations. Charity:Water was the only one to acknowledge immediately via automated email and shortly thereafter via personalized email responding to my question. I'm still waiting for responses from the other organizations. My donation to Charity: Water immediately produced a tax document and a welcome message from the organization setting expectations about how my donation would help and when I could expect to hear about the completed project I had contributed to. Given that memorable customer experience, 7 insights come to mind that you might apply to your business. 1. Make it as easy to do business with you as Charity:Water is to donate to. Make sure your website is helpful and educational. Have tools and resources available online. Figure out how to include a self service element for those looking to complete a task in the middle of the night. Charity:Water offered several banner images to use for the campaign page I set up. I was able to easily customize the writeup for my campaign to make it relevant to my family. 2. Make it talk-worthy! Several contributors to the campaign set up for dad have commented about their experience. Charity:Water has made it easy to learn more via fabulous visuals on its website. Check out the locations of completed projects. I was delighted to notice so many in Ivory Coast where my family lived. Thank you so much for reaching out to us! We work with more than 22 implementing partners around the world to assess and determine areas and communities in need of clean water and sanitation. We choose the countries where we work based on water scarcity, poverty, political stability -- and the availability of strong local organizations in which we can partner with for major change. Please note: charity: water can’t accommodate requests from donors to work in certain countries. We honor the chance to be good stewards of your fundraising efforts – and we take it very seriously. You can be sure that 100% of the money you give or raise will go to a community that’s very much in need. 4. Lose no opportunity to educate. 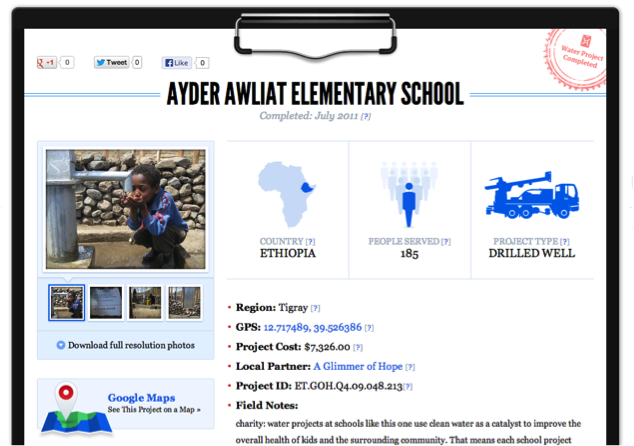 Charity: Water's entire site is about education. It educates via photos and videos and compelling facts about the need for clean water. Education creates opportunities for conversation. It also builds credibility. 5. Have spotless followup. 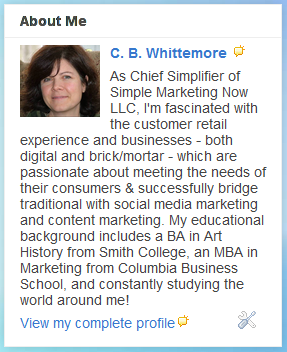 I can't say enough about how important this is for building relationships with customers. 6. Take care of the details. For a charitable organization, it's important to immediately generate a tax form. For your business, it may be about creating a checklist for preparing for an in-home consultation or for a business audit. Anticipate your customers' needs; think through what they might encounter and address those details. 7. Make it about the greater project and not about you. Who wants to hear about how wonderful you and your organization are? Rather, share your big picture vision. Invite others to participate and share their perspectives. Help others feel good. Imagine turning your birthday - traditionally all about you - into an opportunity to give back! 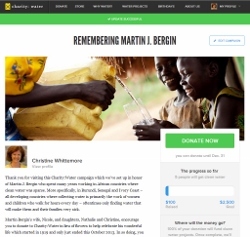 If you'd like to experience Charity: Water, I invite you to do so by exploring the campaign I set up to remember my dad, Martin J. Bergin. Then, come back and add to this list of customer experience insights from Charity: Water.